Our trailers were purchased with safety and reliability in mind. 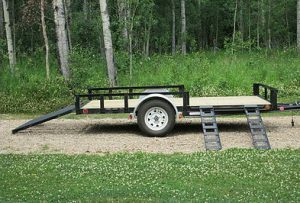 The wide flat deck allows ample room to safely walk around our side by sides and secure them to the trailer. 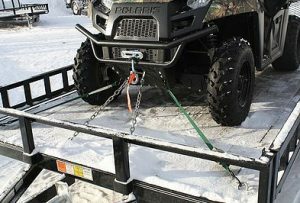 We have outfitted all of our trailers with 4 safety chain securing points. Even in the event of a tie down failure, the side by sides will remain secure on the trailer. This also makes securing the machines safe, fast and easy. We supply self-winding straps to secure the machines, the excess material stays securely wound inside the housing of the straps. No straps blowing in the wind, and no stopping on the highway to re-tie them. Safety is our first priority. 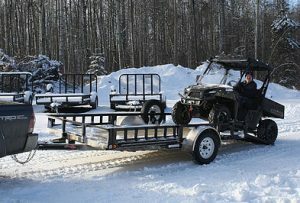 Each trailer has a heavy rear ramp for loading side by sides and quads, as well as front ramps for loading a second quad. 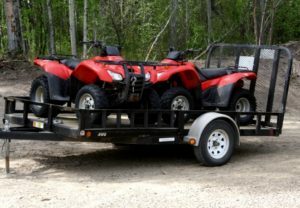 This is a great feature, allowing 2 quads to be easily loaded while the trailers remain compact, light, and easy to maneuver.